Science seems to be on a mission to Bluetooth everything in existence and connect it to our smartphone so we can constantly be bothered by push notifications in lieu of actually thinking. The latest victim in the app-ization is that old cooking standby—the pan. 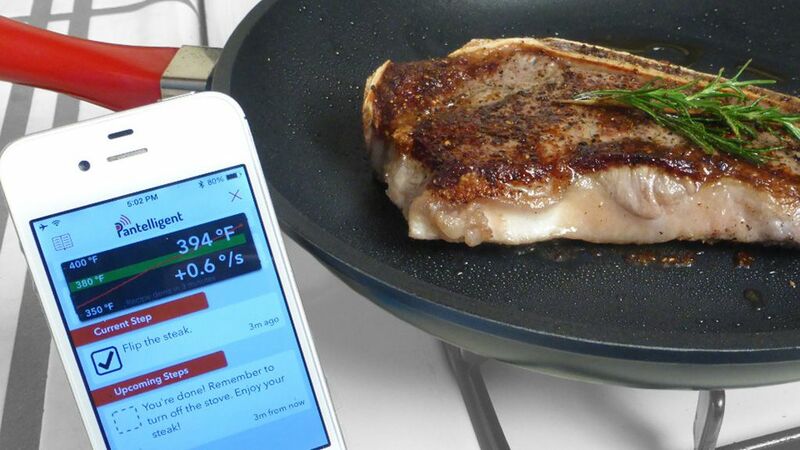 Though the ability to monitor the temperature of your pan sounds helpful, Pantelligent refuses to take the rest of your cooking skills for granted. Instead, it hopes to remove all of the guesswork from making a meal—it arrives preloaded with plenty of recipes for everything from shrimp scampi to beef Stroganoff. You just follow along on your phone. The pan’s Kickstarter site even shows a woman cooking salmon from her couch, because everyone knows all the best chefs like to fire up the DVR while searing fish. Apparently, people are on board with the idea. Pantelligent has already reached its funding goal of $30,000 in less than a week—and funding will continue until January 6. The planned retail price for Pantelligent is $249, but there’s still time to get in at the early bird price of $199, which will require some patience: The product isn’t set to ship until August 2015. Unfortunately, however, Humberto Evans, the man behind the product, forgot one thing: The pan might help you fry, but cooks are still stuck turning on stove burners. What is this? Neanderthal times? Let me grab my kindling and flint.